Life as a trucker means you’ll be on the road - quite frequently. Whether you’re new to driving or a seasoned veteran, there are essential items you should keep stocked in your cab. And perhaps even more importantly, as the world of technology expands, there are new items that can add ease and comfort to your journey. The space on your truck can be limited, but there are crucial items you’ll need, and want, to take over the road. Even if you have a sleeper cab with some extra room, you’ll need to pack smart and for efficiency. Taking along only the important tools and items on the road is the key to successful packing. Even infamous drivers such as Allie Knight have their go-to items that they consider indispensable. Time on the road and driving in many different scenarios will certainly aid in deciding what exactly is worth bringing along. For example, if you have a trucking job that takes you across Florida in the middle of summer, leave your heavy socks and wool hats at home. But if it is the dead of winter in state such as Wisconsin and you’ll be traveling across icy roads, remember you’ll need extra equipment from thick socks to chains for your tires. Cash - This is physical currency, not debit or credit cards. There’s no need to carry too much, just enough to get purchase supplies and/or fuel in case your wallet goes missing or your credit card is unavailable. First aid kit - A first aid kit should be geared toward caring for minor injuries. There are plenty of compact, pre-assembled, self-contained commercial grade health kits at affordable prices on the market today. The most basic items include a box of adhesive bandages (in various sizes) and a tube of antibiotic ointment. When you get a cut or need to clean a wound, you’ll be glad you have the provisions to slap on a Band-Aid or have access to an alcohol pad for sanitizing the area. A simple kit can keep a driver in line with the old "Ounce of prevention" saying that is highly important for health on the road. Batteries and tools - in an organized toolbox are vital. Keep the basics, from a screwdrivers to mallets and wrenches to jumper cables. Work gloves. 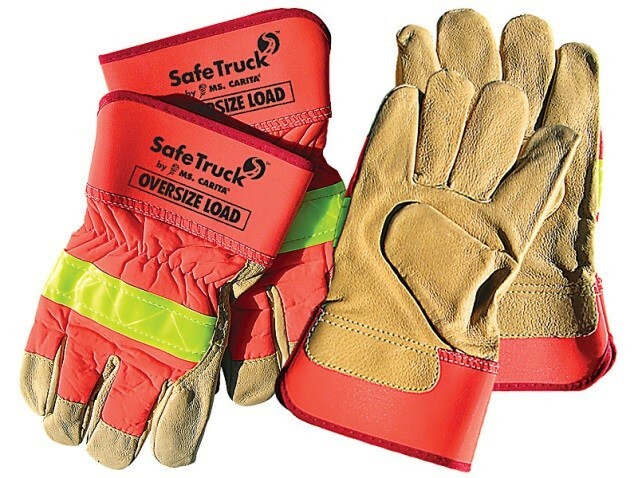 Truckers go through work gloves fairly quickly since they are used in almost every position. Always keep a few pairs around - you’ll want gloves that keep your hands dry and gloves that protect your hands from injury. Many drivers have several different pairs and use a specific pair for fueling, another for loading and still another for driving. Sunglasses - Whether it is the glare of the sun or reflection off the ice, you’ll know how much you need this accessory when you lose your pair. Always have a few extra pairs of shades available. Reading Eyeglasses - If you’re at the age where you rely on a little help to read the messages on your cell phone or need to read the information from your dispatcher, reading glasses can come in handy. Some drivers prefer to use them when they get to a swap meet or a convention such as the Great American Truck Show in Texas in order to properly inspect tools and parts. Stash them everywhere in your truck, even in the first aid kit and emergency kit. Clothing - As a commercial truck driver, you are likely going to be on the road for several days at a time. Packing the necessary clothing will help avoid having to make an expensive purchase on the road at the last minute. You’ll want to choose versatile clothing since apparel that is appropriate for both working and also sitting for long periods of time. The truth is that you'll likely be wearing your jeans for a couple of days in a row. It is beneficial to have items with extra pockets, and fabrics that are both breathable and durable at the same time. No driver wants to be caught working in Southern California in the dead of the summer with clothing that is too heavy or clothing that impairs their ability to work efficiently. Be sure to check the weather and in the winter months take extra layers, a warm hat, and heavy socks. Nothing feels worse than working and driving with wet feet. Speaking of feet, sturdy shoes are a requirement and make sure they fit comfortably. Don’t try to break in new footwear on the road. There also may be a need for safety-related clothing, such as the high visibility neon yellow or orange vests or shirts that are reflective. If your company does not supply a uniform, you may be required to purchase these items on your own. Luckily, there are apparel companies that specialize in garments for truckers both online and in person. Toiletries - A small kit of basic grooming aids takes minimal space and is a necessity on the road. You may get access to showers, but you’ll often need your own shampoo and soap. You’ll also want deodorant, toothpaste, toothbrush, comb are among those items which you use daily in your own home. Baby Wipes - Yes, baby wipes. They are invaluable when you need a quick cleanup during the day to remove dirt from your face and hands or just to freshen up. Light It Up - Flashlights are a requirement for any driver, and this is especially true for truckers. There are a multitude of flashlight options from handheld military grade to hands-free styles. Consider what exactly you want to light, where you'll use it most often and how you’ll use the light. You may also need specialized reading or map lights and spare bulbs for those overnight trips. Road reflectors - Prepare to have emergency flares, cones, and warning triangles in case there is a situation where you need to divert traffic or warn the public. These are also handy when your rig doesn’t quite fit in the rest area space and you want to create awareness of how much space you are taking up to avoid any accidents. Non-perishable Foods - It’s nice to have food and water with you in the cab just in case there’s no truck stop or convenience store for miles. Also, eating out for every meal can be time-consuming and expensive. Fruit like bananas and apples are great for nutrition and your waistline, but you’ll want to stock up on items that last over a period of days or weeks.Consider items such as protein bars and nuts - bottled water is a must. Prescription medications - Be sure you have ample medicine to last throughout your trip. You don’t want to be searching for a pharmacy in unfamiliar territory. However, before stocking up on that medication, be sure to check that it is DOT-compliant and that consuming it will ensure your safety on the road as well as others. Gadgets - The world of technology changes constantly and influences your life on the road. There are basic electronic devices that every trucker relies on to make truck driving efficient to more sophisticated in-cab technology that is considered cutting edge. From apps on one's smartphone to cell phone signal boosters to help on remain in contact, there is no shortage of gizmos that one can give a driver in order to help them feel connected and efficient. Navigation. No longer futuristic, a GPS can be considered an essential tool, not just a gadget. Purchase a GPS Navigation device that is prepared and designed to be used by trucks. There is a big difference between commercial truck navigation devices and navigation systems prepared for passenger cars. 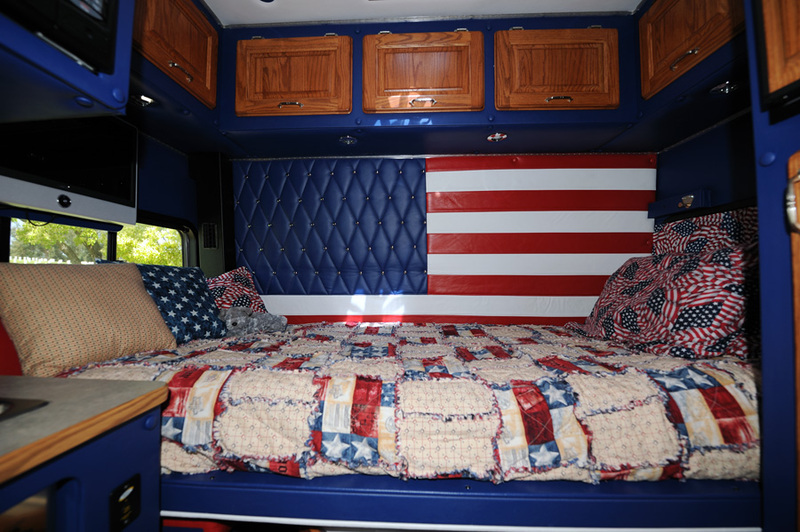 If you have a sleeper cab, you’ll want to make it feel as close to home as possible. Although you will need pillows, a mattress or something soft to sleep on, don’t be afraid to splurge a little and make your space a little comfier. A heated blanket is one of those “luxury” items that will put a smile on your face. Earplugs may not seem like an item to splurge on.But this item is very relevant to team drivers, particularly if the co-driver snores. A set of earplugs ensures good rest, which every driver requires to be safe and efficient on the job. Believe it or not, you can have your own microwave while driving a truck. It makes eating or reheating food a snap while you’re on the road. Most truckers today have a power inverter (generator) that can run a microwave. Creating order for all these items will lessen the stress on the road. The old saying, “a place for everything and everything is in its place” is a lifesaver when you’re trying to make good time and don’t want the hassle of searching for your toothbrush. Sort and store your items in groups that make sense. For example, put together a small waterproof bag or pouch that can contain everything you’ll need for shower stops. Instead of lugging that big duffel bag around when you want to clean up, it's much easier to have a small bag just large enough to put your toiletries and a single change of clothes. Instead of searching for your charger in your backpack, designate a side pocket in your case where you can quickly get access instead of fumbling around when you need it. 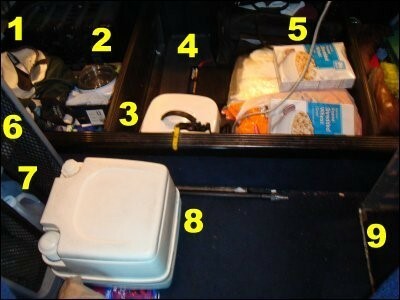 Before you go out and equip your cab with essentials for being on the road, make a list. It is tempting whether you are shopping in a store or online to add peripheral items and get things you probably don’t need. A list will keep you focused and will save you money and time.You can always add additional items as you decide you need them. 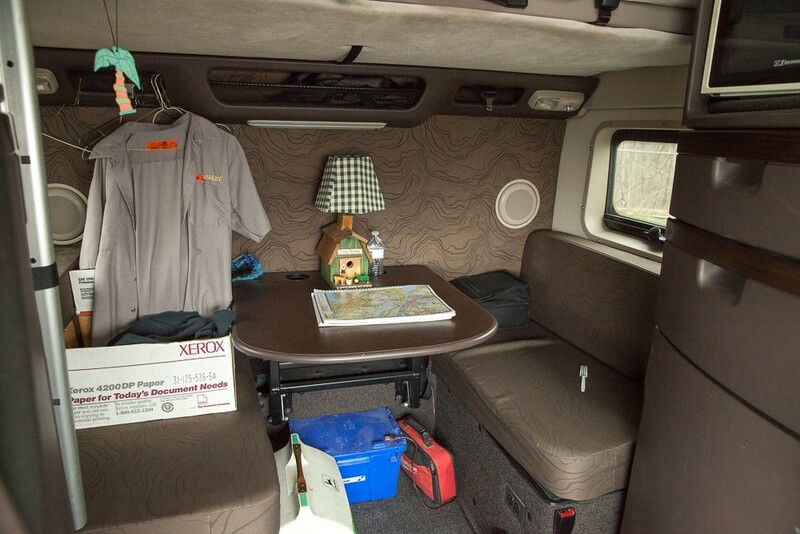 Being concise and organized is the key to a comfortable life on the road.